Nick covers Capitol Hill and climate change for E&E News. 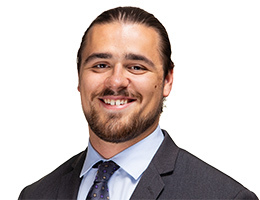 Since joining the company as an intern in 2016, he has reported on the Department of Defense, infrastructure, permitting rollbacks under the Trump administration and American Indian issues. He holds a degree in government and creative writing from Hamilton College. New Mexico Rep. Ben Ray Luján, a top House Democrat who is running for Senate, said last night he would co-sponsor the Green New Deal. Washington Gov. Jay Inslee (D) is petitioning the Democratic National Committee to have a presidential primary debate entirely about climate change, a potential boon to his quixotic 2020 candidacy. Rep. Alexandria Ocasio-Cortez (D-N.Y.) may not visit a Kentucky coal mine after all.